This handsome resident bird is not a common sight, as once it was on country lanes in Britain. It is a member of the bunting family and only a rare garden visitor. Some female Yellowhammers have very little yellow colouring, but others are as bright as the males. 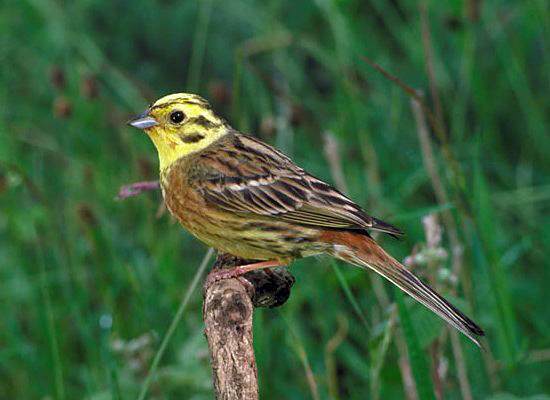 Insects and weed seeds are the main food sources for Yellowhammers. Yellowhammers build their nests low down in bushes and hedgerows or sometimes on the ground, using grass, moss and hair. In late spring and summer they produce typically three to five white eggs covered with purple-brown scribbling. This page includes pictures kindly contributed by the Countryside Council for Wales.